The retro-pimping continues. While you’re tricking out your PC with vintage synth chips pillaged from a Commodore 64 (see last week’s report, why not add an integrated audio cassette deck? The PlusDeck (available from ThinkGeek) is a cassette audio deck (Windows-only software) that fits into the drive bay of your tower. It streams in both directions: rip your cassettes into digital audio files (sweet! 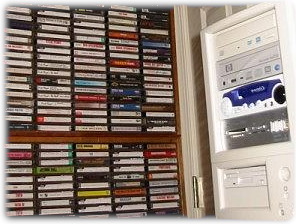 ), or even rips your digital audio files onto cassettes so you can . . . um . . . hell, if anyone decides to go strutting around with a giant boombox pumping out sound from your cassette, PLEASE SEND PHOTOS. (Seriously.) Fight the Power, anyone? I was going to link to this today, and then conveniently enough, I see via Gizmodo that a guy named BjÃƒÂ¶rn Endre has just reviewed it. BjÃƒÂ¶rn likes the gear but thinks US$149.95 is too much for something that would get occasional use. Occasional use? That ignores the fact that, in addition to ripping, you can play cassettes live from this thing. And of course, that’s what makes this thing worth it: the ability to listen to your archive of mix tapes without (the horror!) converting them to MP3s. If anyone buys this , please, please let me know. Next I want an 8-track bay.